The 6th Annual Research Symposium was held on 10th November 2016 from 8.30 am onwards at M.B. Ariyapala Auditorium, Department of Sinhala- UoC. 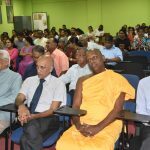 The keynote speech was delivered by Professor Asanga Thilakarathne, Buddhist Studies Unit, University of Colombo.